EARRING - Dangle earring set is made from hand poured fine metal and antique finished. 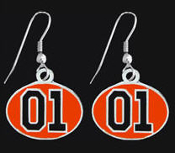 Diecut Dangle earrings are approx .75 of an inch wide x 1.375 inches high with wire and displayed on hypoallergenic wires. - Sometimes this item is out of stock: Delivery 4 to 5 weeks - We will let you know via email.